When you receive a PDF document by email that you must sign, the process of printing out the file, signing on the dotted line with a pen, scanning the signed document and sending it back can be a rather tedious task. Fortunately, Apple has added the ability to electronically sign a PDF document using Preview, a program that comes preinstalled on every Mac running OS X Lion or later. The steps involved to electronically sign a PDF using Preview on Mac are quite simple and will save you valuable time, especially if you have multiple documents, contracts, forms or other paperwork to sign. If you are worried that your virtual signature will look bad, rest assured that you can create your signature by using the trackpad or holding up your signature on paper to a Mac's built-in iSight camera. Click on the Markup icon ( ) and then the signature ( ) icon. If you are using the trackpad to create your electronic signature, it is recommended that you look at Preview and go slow and steady with your finger to achieve the best result. For an even more precise signature, you can use an iPhone or iPad stylus, preferably one with a fine-tipped ending, to draw your signature on the trackpad. Signing a piece of white paper and holding it up to the camera is the easiest way of creating an electronic signature in Preview, although this method does not always yield the best results. 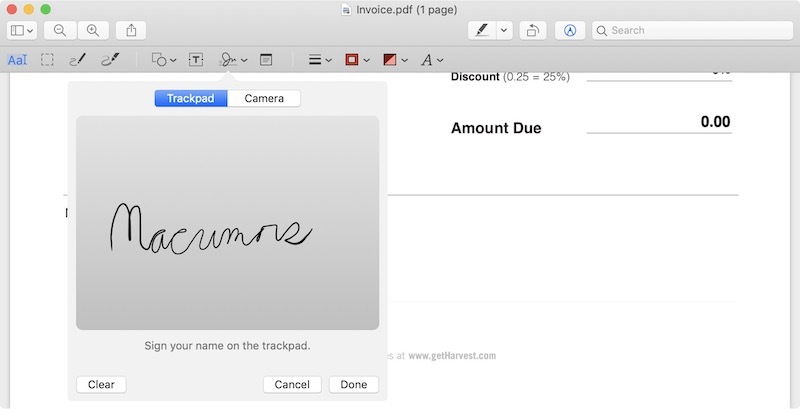 The signature will appear inverted when you hold it up to your Mac's camera, but Preview will automatically ensure that it reads properly from left to right. You can create an electronic signature in Preview by following steps above even if you do not have a PDF document opened. By default, all electronic signatures that you create are automatically stored in a list on Preview so that you can insert them into future PDFs documents and other files without needing to repeat these steps. Preview can store multiple signatures at once. Apple also provides markup tools in the Mail app in macOS to create electronic signatures that can be directly inserted into your emails. While people often do refer to this as a "digital signature", it really isn't anything of the sort. A digital signature is a cryptographic entity that at some level proves that you are indeed who you claim you are. It generally doesn't involve anything resembling your on-paper signature. Anyone can append a rasterized/digitized version of your written signature to a document - it doesn't have to be you. With a real digital signature, though, that can't happen unless you are sloppy with your private key(s). "Click on the briefcase icon"
This is exactly what I was going to say. I thought this article would be about RSA. This scanned signature is a joke, if I sent my invoices with such a signature, my clients would laugh (and obviously return it), this has no legal value whatsoever. I was hoping to view an easy way to sign with a certified signature (a cryptographic token) in Preview.app, I've been doing it with Acrobat until now. Doesn't matter. Preview 8.0 cannot even properly render PDF. And apparently Apple don't care. False alarm: signatures still work, despite the font anti-aliasing being wrong. Quit whining. Nobody is asking you to pay for it. It's free in OS X. Thank you. I like this tip. You beat me to it. Briefcase? Someone needs a rest break. Nice awareness-raising article but I am not sure why this is a Macrumors post. I've been signing PDFs on my 2013 mba for a while now so it isn't a brand new thing. Maybe new to Yoshemite though. Yes you can import images. Just drag and drop the signature image file onto the PDF. You might need to be in signature mode first, I can't remember. Based on what it looks like it can really be interpreted either way. it really can't. briefcase makes no sense. No, a PDF in Preview will not allow you to import/drop an image into it. The PDF has to be converted to an image, then you drop the image into it and convert back to PDF. If you believe this to be wrong perhaps you could create some step by step instructions, because my own testing and a whole lot of googling and no one else has found out how to do this. Ah, I was wrong re drag & drop images onto PDF. Turned out the PDF on which I did this, I saved as a JPEG or something, then dropped my signature file on it, and resaved as a PDF. Lol. Also been known to copy and paste text from a page of a PDF to a Word doc (it keeps most of the formatting) for altering / inserting something, then re-save as PDF, and re-insert the relevant page via Preview. I understand what you mean. However I'm frequently emailed files / contracts / agreements and asked to print, sign, scan and return them. This saves all that printing and scanning hassle. I've never in my life been asked to cryptographically sign a document. I'm sure the day will come, it hasn't arrived yet.